For the bass fishing experience of a lifetime, come fish for trophy bass with Lake Fork bass guide James Caldemeyer. I guarantee that I'll do my best to give you the best bass fishing experience possible. It's my responsibility as your guide to show you what is needed to find those Lake Fork Lunkers. 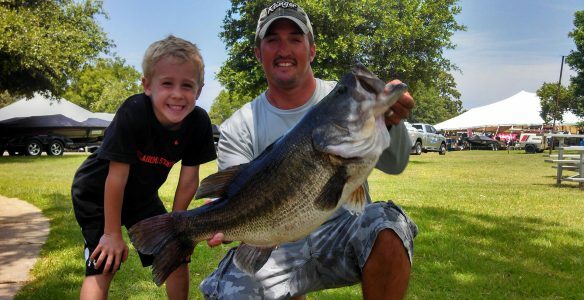 Lake Fork, Texas is the place to fish for trophy bass. 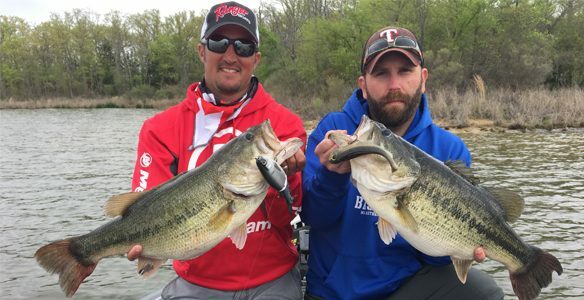 If you are interested in a corporate bass fishing adventure on Lake Fork, I'll arrange your trip, lodging accommodations, additional guides and give your guests a guided bass fishing trip to remember! James, I can't thank you enough for the wonderful trip I had last Thursday! I learned more from you in 5 hrs than I've learned in almost 40 yrs of fishing. Up until catching that monster, I had caught less than 10 bass total and none over 2 lbs. Catching that monster (10.20 lbs) was the highlight of my life! I still have to pinch myself to be sure it was real, but then again, I'll have the mount from Lake Fork Taxidermy to prove it. You are a true gentlemen and a bona fide expert in the art of bass fishing. I WILL BE BACK. For the masses out there, I can't recommend this man enough. If you come, you will catch fish! My video page contains videos about various topics: Lake Fork fishing tips, instructions, guided bass fishing trips, the best bass fishing equipment and methods for Lake Fork, bass fishing boat and equipment reviews, video fishing reports and more. I plan to update this video page frequently, so please check this page often for updates. If you have a suggestion for a topic, let me know! Call or email to book your trip today and let's go fishing! I’ve been a fisherman for as long as I can remember. My father and grandfather were both avid fishermen and fishing seems to be in my genes. I find it hard to express the enjoyment I receive from bass fishing. My father introduced me to Lake Fork over 15 years ago. It was love at first bite. I could not believe the consistent quality of fish that Lake Fork produces. Being a Lake Fork bass fishing guide enhances my fishing experience. I find great enjoyment in taking someone fishing and seeing that same thrill when they tie into a HAWG. I want to share this feeling with all of my clients — the beauty of Lake Fork, the thrill of catching large bass and the opportunity with each cast of catching the trophy bass of a lifetime! I am committed as a fishing guide to giving you the ultimate experience you deserve. Whether you’re a novice or an avid bass fisherman, I take my job as your Lake Fork guide seriously. Let’s put you on the fish! I would like to thank my friends and sponsors for all that they have done for me. Their generosity has helped me give you a quality bass fishing experience on Lake Fork, Texas! If you have a moment, please click on the image below to learn more about them.